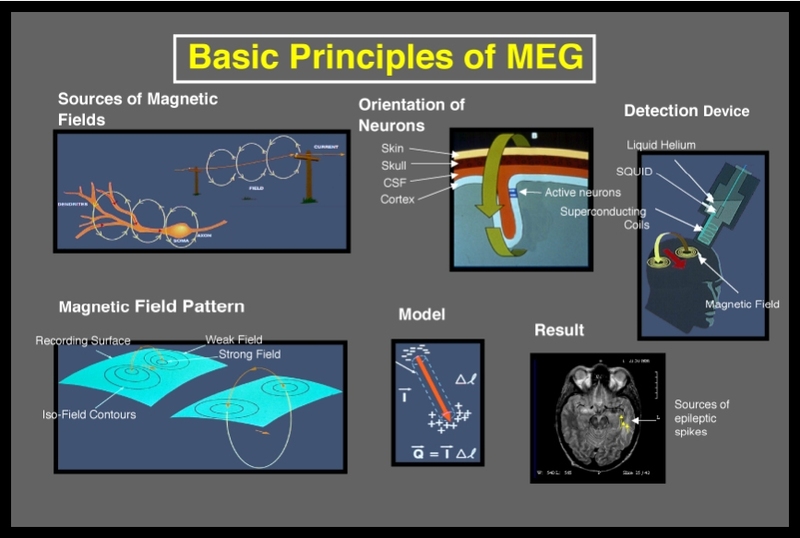 Magnetoencephalography (MEG) is a non-invasive neurophysiological technique that measures the magnetic fields generated by neuronal activity of the brain (Figure 1). 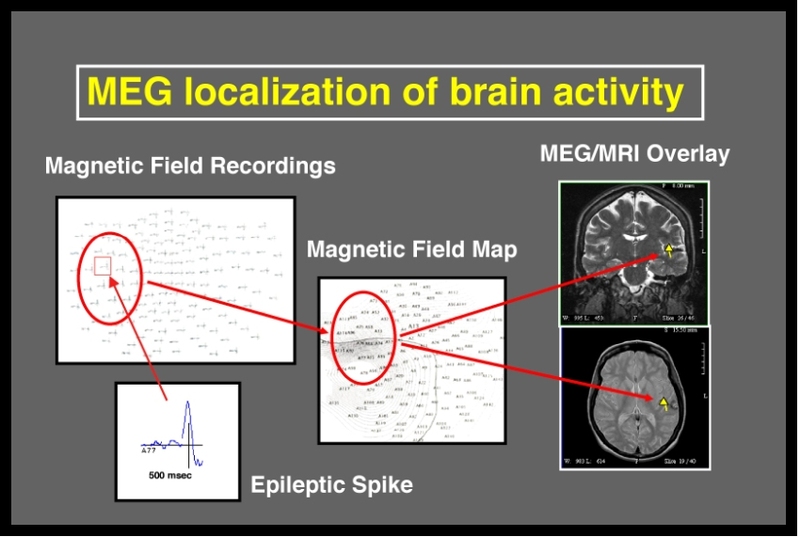 The spatial distributions of the magnetic fields are analyzed to localize the sources of the activity within the brain, and the locations of the sources are superimposed on anatomical images, such as MRI, to provide information about both the structure and function of the brain (Figure 2). MEG is a direct measure of brain function, unlike functional measures such as fMRI, PET and SPECT that are secondary measures of brain function reflecting brain metabolism. MEG has a very high temporal resolution. Events with time scales on the order of milliseconds can be resolved, again differentiating MEG from fMRI, PET and SPECT, which have much longer time scales. MEG has excellent spatial resolution; sources can be localized with millimeter precision. MEG is completely non-invasive. It does not require the injection of isotopes or exposure to X-rays or magnetic fields. Children or infants can be studied and repeated tests are possible. MEG is complementary to other modalities, the information provided by each modality adds to the full picture. Magnetic fields are found whenever there is a current flow, whether in a wire or a neuronal element, as illustrated in the upper left panel of Figure 3. The magnetic field passes unaffected through brain tissue and the skull, so it can be recorded outside the head (upper middle). The magnetic field is extremely small, but can be detected by sophisticated sensors that are based on superconductivity (upper right). By analyzing the spatial distributions of magnetic fields (lower left), it is possible, by using a model such as a single equivalent current dipole (lower middle), to estimate the intracranial localization of the generator source and superimpose it on an MRI (lower right). The sequence of recording and analysis steps is shown, starting from 148 MEG time series waveforms containing an interictal spike (lower left panel of Figure 4). The segment of data containing the spike has been clipped out and shown on a display of the sensors around the head projected on a flat surface (upper left). The amplitude of the spike at its peak is shown as a topographic map (middle). The spike shows a phase reversal over the left temporal region. A calculation of the spike location using the single equivalent current dipole model reveals a localization of the spike source in the left temporal lobe (right). The spatial and temporal properties of MEG are illustrated in the left panel of Figure 5. Only MEG has extremely high temporal and spatial resolution, as represented in the lower left section of the graph. Other functional modalities, except invasive EEG (iEEG), have either poor temporal or spatial resolution. Clearly iEEG has the distinct disadvantage of being invasive. The main drawback of MEG is shown on the right panel of Figure 5. The MEG signals of interest are extremely small, several orders of magnitude smaller than other signals in a typical environment that can obscure the signal. Thus, specialized shielding is required to eliminate the magnetic interference found in a typical urban clinical environment. MEG is a unique and effective diagnostic tool for evaluating brain function in a variety of surgical planning applications. The fundamental advantages of MEG are listed in Figure 6. Figure 1. Basic principles of MEG. Figure 2. MEG combines functional information from magnetic field recordings with structural information from MRI. Figure 3. Electrical activity in neurons produces magnetic fields that can be recorded outside the skull and used to calculate the locations of the activity within the brain. Figure 4. The sequence of steps to localize sources of neuronal activity from time-domain recordings to MRI overlay. Figure 5. 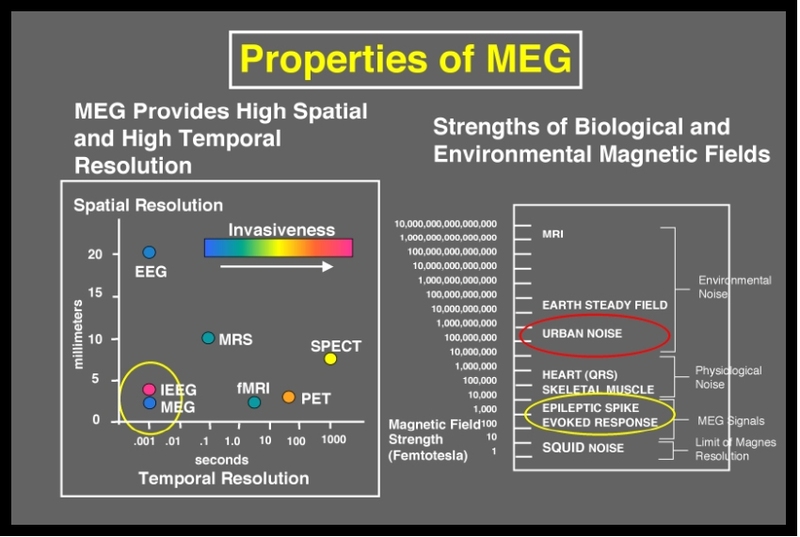 MEG has the advantages of very high temporal and spatial resolution, however it requires highly sensitive instrumentation and sophisticated methods for eliminating environmental magnetic interference. Figure 6. 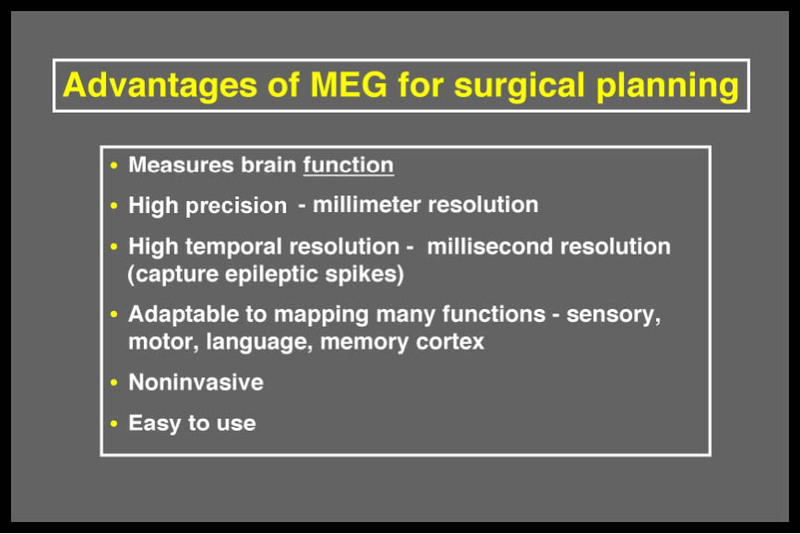 Advantages of MEG for surgical planning.